It felt so good to play with colors other than green green and green! 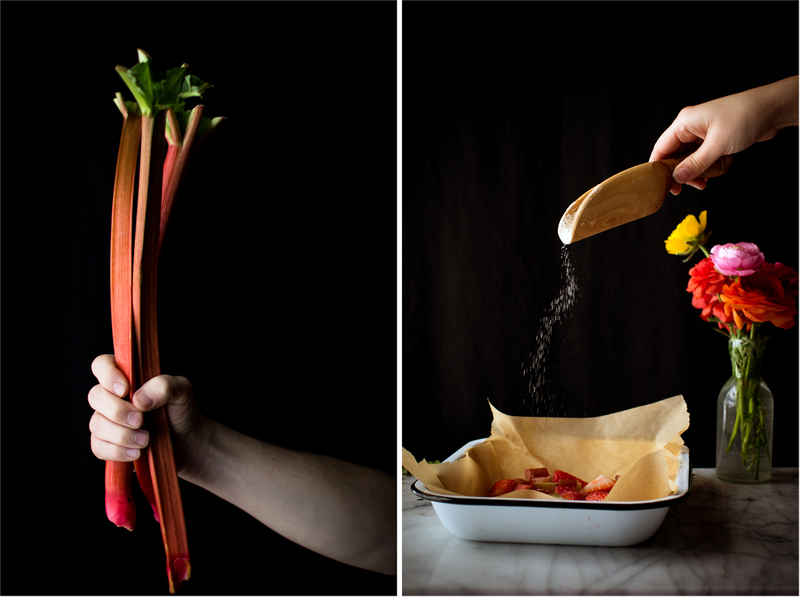 I was photographing these strawberries and rhubarb and just amazed at the vibrancy of it all. The strawberries aren’t at peak around here yet but who can resist when it’s rhubarb season so I snatched up a few pints anyways. 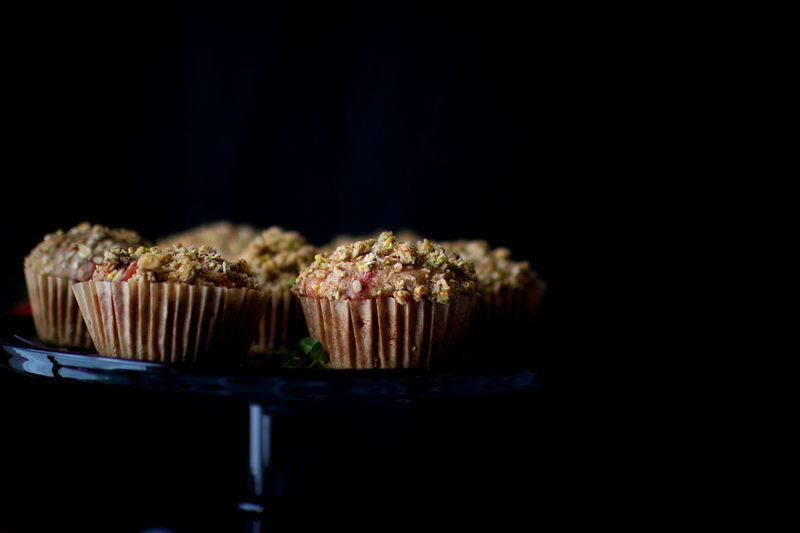 To avoid the disappointment of bland berries, I roasted the fruit before incorporating them into these muffins to bring out their natural sweetness which pops in every bite of the muffin. 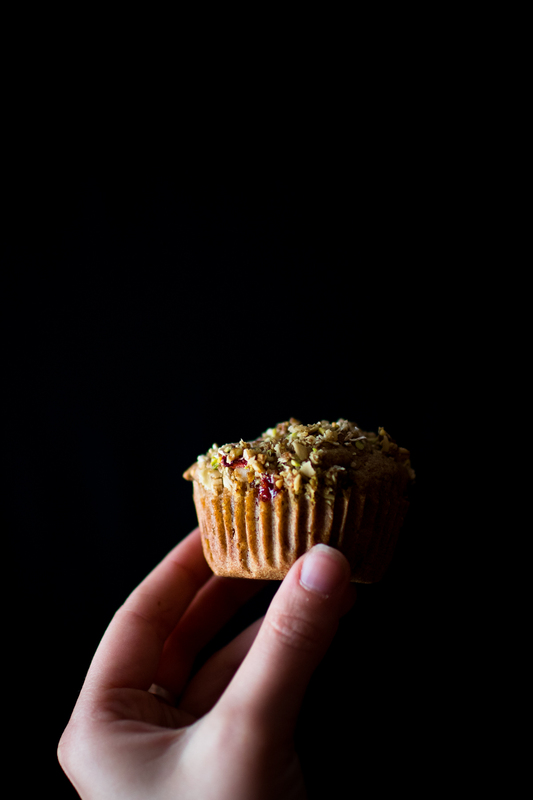 The crumb has a pistachios base because…well I’ve become pretty obsessed with pistachios. I love how they are the only nuts that can give you a pop of color while still giving that filling and crunchy texture to your baked goods. 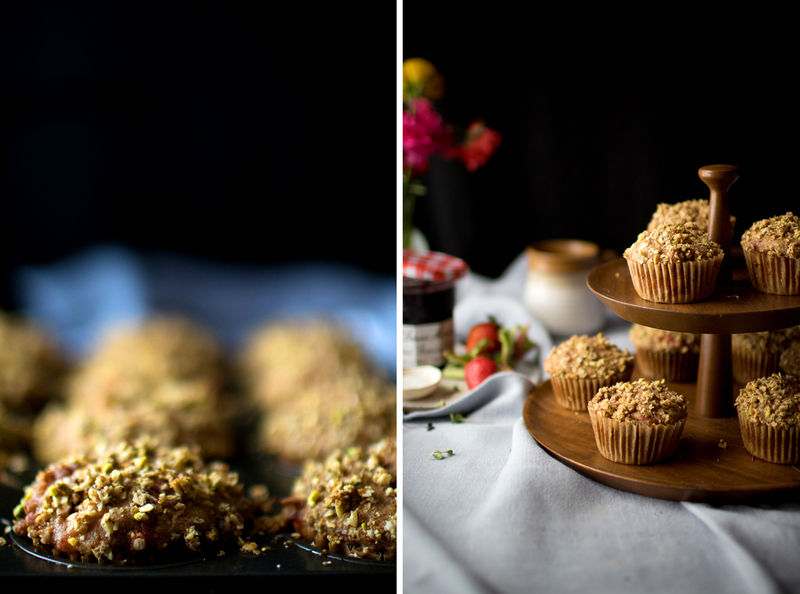 Heck, I’d even go as far to say that pistachios have become the staple to my baking as much as matcha has to Molly Yeh or dates as sweeteners to Oh Ladycakes. 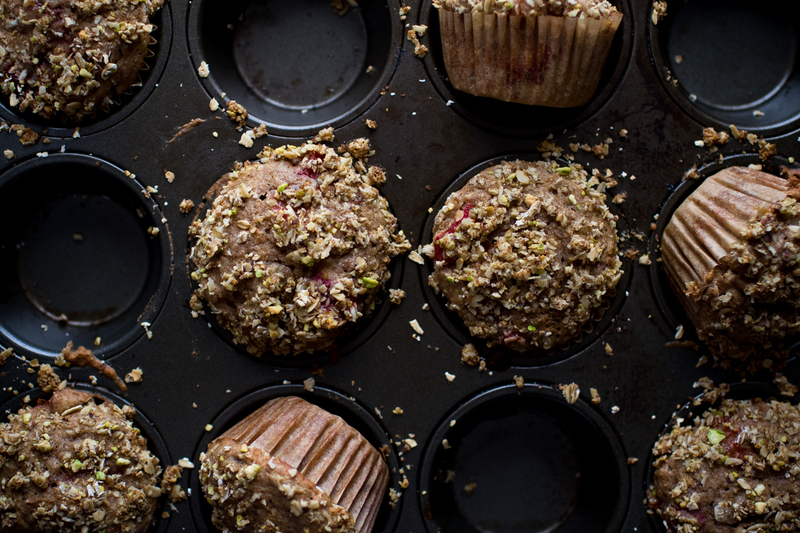 These muffins are light, bright in flavor, and, dare I say, healthy! They are the perfect breakfast treat or afternoon snack. I used spelt flour in this recipe but you can substitute for all-purpose flour if that is what you have on hand. If using spelt flour, be sure to not over-mix as I’ve been told it’s a delicate flour. I also swapped out the spices for lemon zest to give it an extra bright flavor but you can sub in cinnamon, cardamon, nutmeg etc if you’d like a spicier treat! Preheat oven to 375 degrees and line a baking sheet with parchment paper. 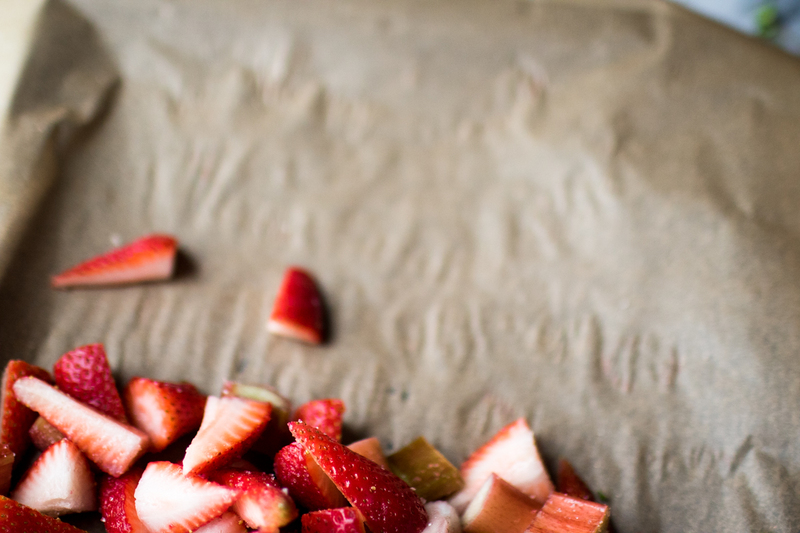 Transfer the strawberries and rhubarb to the baking sheet in a single layer and sprinkle with sugar. Bake for 20 to 25 minutes or until the strawberries start to ooze. Remove from oven and let cool completely. Lower your oven to 350 degrees. Measure out the coconut milk in a large liquid measuring cup and add the apple cider vinegar. Let sit for about ten minutes so that the vinegar has time to create with the milk. Line a muffin pan with 12 muffin liners and set aside. In a mixing bowl, whisk together the flour, baking soda, salt, and lemon zest. Make a well in the center of the dry ingredients and add the mashed bananas, egg, oil, maple syrup, vanilla extract, and coconut milk. Whisk the wet ingredients together until combined and then fold the dry ingredients into the wet until just incorporated. Next, fold in the roasted fruit. Evenly divide the batter between your 12 muffin pan and set aside. In a food processor or high speed blender, pulse the oats, pistachios, brown sugar, salt, and butter until combined and a chunky crumble has formed. Top each muffin with a tablespoon of crumb (or divide it evenly between all the muffins) and transfer to your warmed oven. Bake for 18 to 22 minutes or until the top has browned and a toothpick comes out of the center muffin clean. Love that you roasted the berries and rhubarb to concentrate flavor and color. 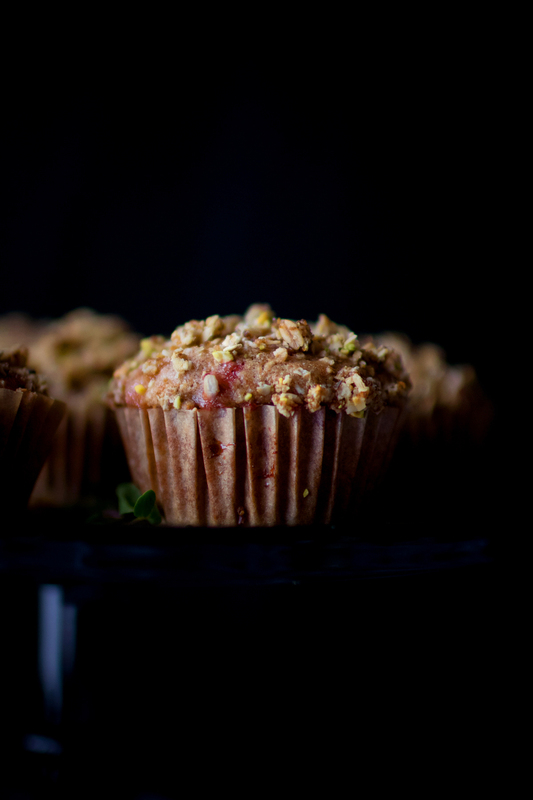 Raw strawberries baked into muffins usually are disappointing. Roasting changes everything. Could not agree more about raw berries sometimes being a bit of a let down in baked goods – roasting really does do amazing things to improve that! Yum! 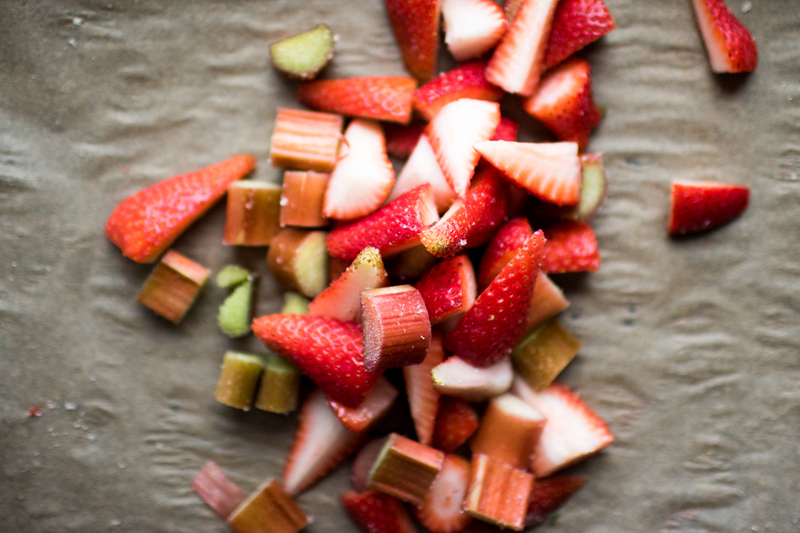 I can’t wait to make these once I get my hands on the perfect strawberries and rhubarb this summer! Your photos are gorgeous btws! Thanks, Katie! 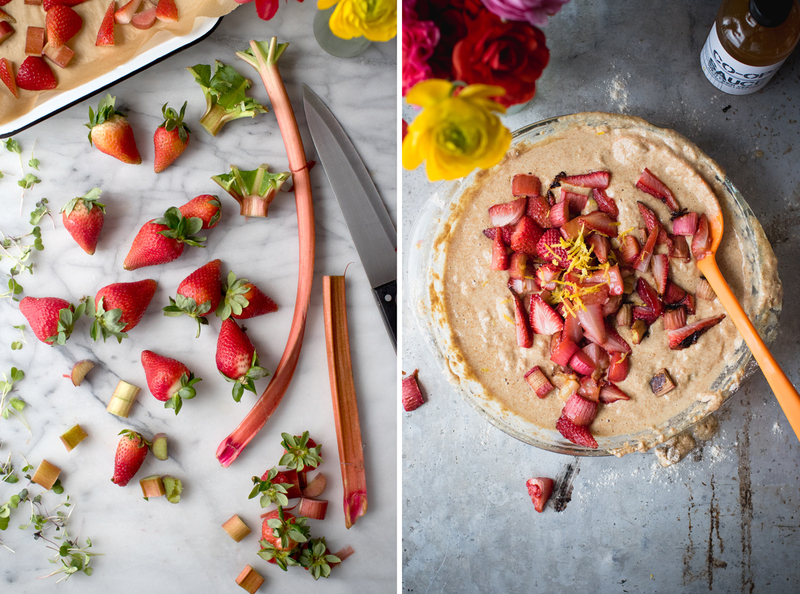 I’m excited to see the fun and springy recipes you come up with once the rhubarb hits your neck of the woods! Hurrah for spring! You’ve pretty much captured everything that’s good about this time of year in one delicious treat. And I absolutely love + am fully supportive of your love for pistachios. I can’t get enough of them either + the combo with strawberries is always particularly good. Thanks, Kathryn! 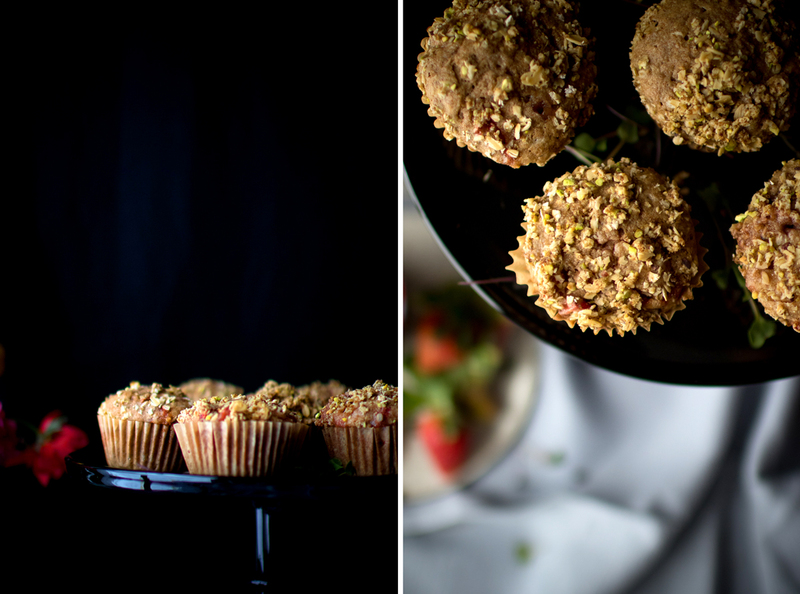 I totally agree that the strawberry + pistachio combo is fantastic and perhaps underrated? I’ll work on trying to change that! 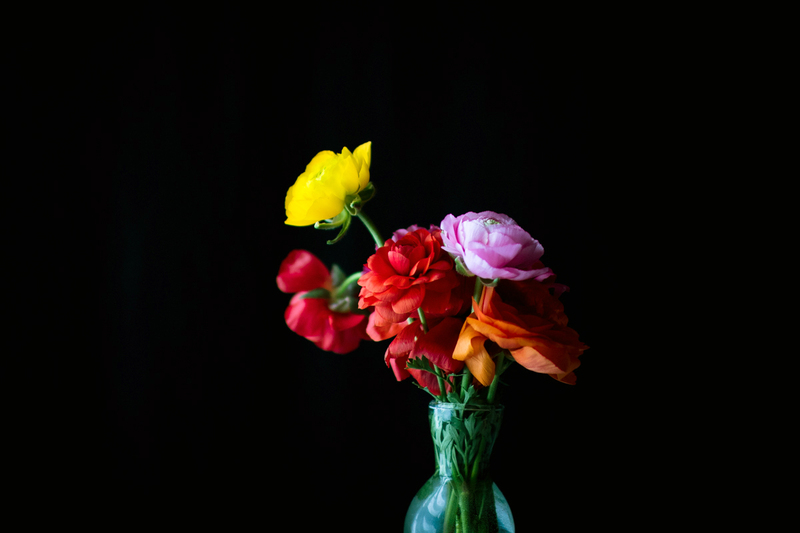 This post is stunning; an ode to spring! An ode to spring for sure! Thanks for the kind words, Sini! Yes – the market here is super quaint and pretty for sure! You’ll have to make a trip to the Midwest soon and I will bring you there!! It’s been spring here in St. Louis for well over a month, I feel lucky about that. But why can’t I find ramps here in STL? Why can’t I find rhubarb? What’s going on in the world? Love this post Shelly, xo! Is it possible to get the weight measurement for the flour? I tried making these and they came out gooey on the inside even when kept in the oven longer. While it might be my lame oven (gonna get an oven thermometer), I just want to try to cover all bases so I can try again. that rhubarb looks insane, shelly! can’t wait to get my hands on some soon! this post is so beautiful, love all the angles and light <3 happy spring!!! Awww – thanks for the kind works, Lindsay! I just finished making these. They didn’t rise and we’re all stuck to my paper muffin cups. Not happy! Oh no! Bummer! I’m thinking I may re-post this with weight measurements as it seems that some people are having trouble with this recipe but mine turned out wonderful. I’m also wondering if your dough may have over-mixed as spelt flour is super sensitive? I actually used regular flour and whole milk but those were the only differences. I’ve been thumbing through your muffin recipes in preparation for hitting the road suuuper early tomorrow morning. So pumped for these! They’ll both motivate me to get out of bed and impress the bf’s mom. Can’t wait to make ’em.